The Hiram Key is yet another example of "Von Daanikens syndrome" where wishful thinking and pre-determined conclusions replace facts in the presentation of opinion masquarading as theory. It is an entertaining read, and certainly presents some interesting ideas. But its presentation of opinion as fact does both Freemasonry and the academic study of masonic history a disservice. 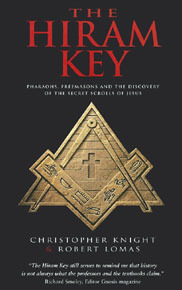 In short, the authors claim to have proven that Freemasonry traces its roots to the death of the Egyptian king Seqenenre in 1570 BCE at the hands of the Hyksos. Moses incorporated this event as well as Sumarian and Egyptian mythology, symbols and philosophy to create a rational for his royal line; Solomon incorporated these symbols into his temple; Jesus and the Qumran community utilized a ritual based on this story; and the Roman Church effectively suppressed the original beliefs of this Jerusalem Church. The Templars, discovering the Qumran communities' records in the vaults under the Temple in Jerusalem, transported them to Rosslyn Chapel; and when Scotland became unsafe for the Templars, they incorporated their beliefs and history into the rituals of Freemasonry. A pretty story, but it doesn't qualify as history. As an example, the authors provide a loose definition of a little documented or understood Egyptian philosophy, possibly called Ma'at. They then show that an equally superficial description of Freemasonry sounds very similar. They take every opportunity in subsequent passages to translate Ma'at as Freemasonry. No proof for this theory is provided. They later refer to this unproven theory as accepted fact. The authors claim that the Master Masons words phonetically translate in Egyptian: "Ma'at-neb-men-ae, Ma'at-ba-aa". 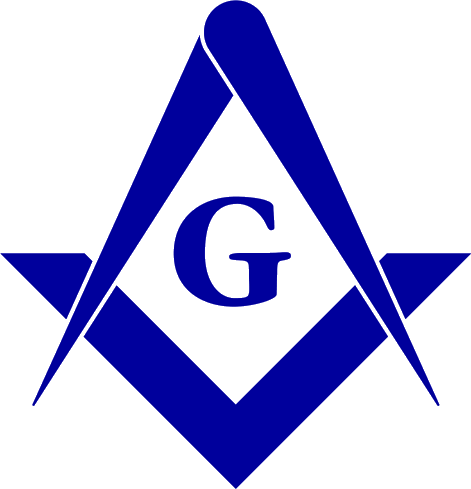 "Great is the established Master of Freemasonry, Great is the spirit of Freemasonry." This may be the Master Masons word in the lodge that the authors were initiated into, but Freemasonry has had such a long oral transmission of certain parts of the ritual that to draw any phonetic link between a much mangled 17th century word and an ancient Egyptian phrase that we have only a best-guess pronunciation of, is either false etymology or willful self-delusion. No proof for this theory is provided. They refer to this unproven theory as accepted fact in subsequent passages. The authors hypothesize Seqenenre died, taking the secret of initiation of the next king (as divine right to rule) with him so that subsequent rulers were not kings but pharaohs (per-aa: great house). No proof for this theory is provided. They also refer to this unproven theory as accepted fact in subsequent passages. As further "proof", Knight and Lomas claim that Seqenenre was buried with his assassin. Discounting this, Emile Brugsch of the Egyptian Antiquities Service, who discovered the mummies in 1875, is noted in Lecas The Cult of the Immortal [pp. 280-81] as uncovering an indescribable chaos of coffins and mummies, it being impossible to determine the original order of burial. The authors hypothesize that Moses knew of the events surrounding Seqenenre and knew of the two pillars used to mark the territories of Upper and Lower Egypt; incorporating these to make a new king-making ritual. No proof for this theory is provided. They refer to this unproven theory as accepted fact in subsequent passages. It is speculated that the survival of the Seqenenre resurrection ritual conferred a divine right to rule on the line of David. As an example of the writing style of this book, note that Genesis 49:6 is suggested, without proof, to refer to the death of Seqenenre and then in a later chapter they claim that it "is the only reference in the Bible to the killing of the Theban king, Seqenenre". Such speculation presented as fact is rife throughout the text. The authors speculate that there were two Jesus Christs: Yahoshua ben Joseph "king of the Jews" and his brother James or Yacob ben Joseph "Jesus Barabbas" also "son of God". No proof for this theory is provided. They refer to this unproven theory as accepted fact in subsequent passages. They theorize that the Christian Trinity is based on the pillar paradigm: two earthly pillars  the son of God is the "tsedeq" pillar, the king of the Jews is the "mishpat" pillar with God the Father as the "shalom" keystone signifying perfect harmony between God and His subjects. No proof for this theory is provided. They refer to this unproven theory as accepted fact in subsequent passages. It is known that the Templar fleet left harbour at the Atlantic sea port of La Rochelle, early on the morning of Friday 13, 1307, never to be seen again. It is hypothesized that they went west, to America. No proof for this theory is provided; one tower and a carving found in North America is good evidence of an early European presence but not of an entire Templar fleet. They refer to this unproven theory as accepted fact in subsequent passages. It is hypothesized that the image found on the shroud of Turin is actually de Moleys, resulting from his torture. No proof for this theory is provided. They refer to this unproven theory as accepted fact in subsequent passages. It is known that Rosslyn Chapel was never used by the family as a chapel  there was a family chapel in the castle  so the authors hypothesize that the chapel was built to house the Nasorean/Qumranian scrolls found by Hugh de Payen under the last Temple at Jerusalem. No proof for this theory is provided. They refer to this unproven theory as accepted fact in subsequent passages. In conclusion, their work is based on selective use of facts, assumptions built on hypothesis and research conducted to prove a previously formulated theory. This makes for good reading, but not good history. The authors have done no original source research. They are not familiar with the ancient Greek, Aramaic, Latin, Egyptian, or Hebrew texts. A book review in the Scottish Rite Southern Jurisdiction magazine, shortly after the books release, expressed disgust with the authors' treatment of Christianity and Judaism and found the book seriously wanting in many respects. The Hiram Key. Pharaohs, Freemasons and the discovery of the secret scrolls of Jesus. Christopher Knight & Robert Lomas. Arrow Books Limited, London: 1997 [first published Century Books Random House: 1996] ISBN 0 09 917562 2.